You can use the links to directly select the individual tables in the catalog of works or use the search field to find specific keywords or works. You can search every entry in the catalog - including material, year or location. Clicking Enter or "Submit" will display the search results. These will show the category of the Catalogue Raisonné in which the search was successful. There can also be multiple hits per catalog page. Click on one of the search results to go directly to the searched results, which are marked in yellow. If this jump to the search result in the relevant Catalogue Raisonné does not work (which may be the case in particular when using a desktop computer), you can nevertheless manually find the search result by scrolling down and up and paying attention to the yellow background. If that does not help, you still have the browser's own search function: Open the works directory page where you suspect the work is located and press Ctrl and F at the same time, then enter the term you are looking for in the search box. Clicking Enter displays the matches on the page. If you have been shown a hit by our site's own search engine, this is safe to find in the directory. Thematically, a distinction was made between Memorials and Wells as public sculptures on the one hand and sculptures on the other. The latter were divided somewhat arbitrarily from a meter size in Large and Small Sculptures, because the impression is obvious that the former had a more public character, the latter, however, had to be classified differently together with the portraits. Tombs and Reliefs are documented separately. In case of the latter, there was sometimes an overlap with other categories, which means that a separate classification can only be justified to a limited extent, but is considered justified because of the technique. The above-named categories are preceded by the works from the Initial Phase of the artist's productive period. The tables of the catalog raisonné are ordered according to number (No. ), Year (year of origin or production), picture (Pic) (see below), Material/Size, Whereabouts, catalog number (Cat.-No.) and Source (for the abbreviations see below). The Cat.-No. is formed from categorie and year. The resulting order gives the position (No.) within the individual category of the Catalogue Raisonné. Transferred to the example above, you will find the work Historia in category IV. Small sculptures on No. 1. The information written in italics is unsecured. Color markings in the No.-column mean destroyed , design and Sculpture can currently be visited in public space. As far as you use a mobile device, you can only see the individual tables in their entire width, if there is enough space on your device. Information that is not displayed due to lack of space can be accessed via the "[+]" character (which appears under the title of the work). Tip: Take your mobile device in landscape mode to see more of the table! The Pic-column documents existing images, which are gradually being put online. If already done, you can zoom in on the image by clicking on the reduced pricture of the work. 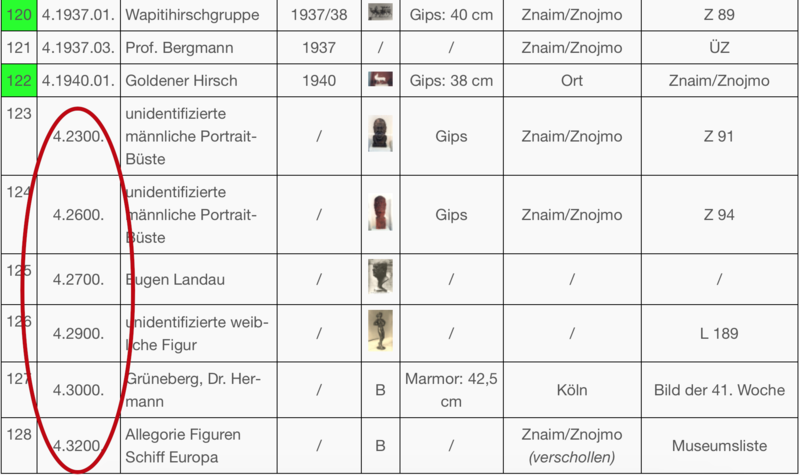 As far as only a simple "B" is noted in the column, an image is available, but not yet online. If a blue B or a is listed, the page has not (yet) loaded the reduced image. Nevertheless you can zoom in on the image by clicking on the blue B respectively the . The note "/", on the other hand, indicates that there is no picture. A click anywhere on the screen is enough to close the picture. You can also use the X in the upper right corner or you use the back button of your browser.